Next Sunday is ‘Trinity Sunday’. 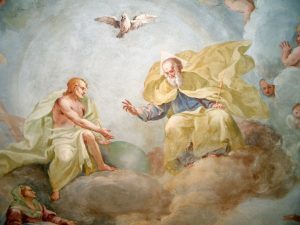 I want to continue my recent blogs that have taken a psychologist’s approach to occasions in the Christian year, and take a psychologist’s look at the Trinity. At first glance the Trinity may seem unpromising ground for a psychologist, but there are two aspects to the idea of God as Trinity. One concerns the essence of God, and the relationality that is at the heart of God. Theologians have recently written a lot about that. The other aspect concerns how humans come to know God, and is nicely summed up in the title of a book by my former teacher, Professor Nicholas Lash, Believing Three Ways in One God. The doctrine of the Trinity is about three ways of knowing God, as well as being about the three-foldness at the heart of God. Though the Trinity is often thought to be obscure, it is actually quite straight-forward when approached from the human angle, as being about three ways of apprehending the transcendent. First, there is a widespread instinct to find God in nature, especially as the source and meaning of nature, in what Mrs Alexander called ‘the stable earth, the deep salt sea, around the old eternal rocks’ (even if the idea that the rocks are eternal shows a lack of grasp of geology). The next strand (sometimes called the ‘Son’ of God) is about the manifestation and active working out of that God. God is both the still point at the origin and centre of all things and also working and weaving in all creation, guiding it and giving it direction and purpose. Then, as Romantics like Coleridge understood, we find resonances of the same source both around us and within us. As I said last week in my Pentecost blog, there seems to have been a deeper sense of Spirit within since the time of Jesus, and perhaps as a result of Jesus’ mission. There has come to be an instinctive recognition that the source of the natural world is also the source of individual human identity. In the Aramaic language Jesus spoke, the same word refers to the source of cosmos and the source of the individual. The assumption is that everything has the same source. Another approach to this is through the psychology of prayer, and I am thinking especially of the work of Kevin Ladd. Some prayer relates to God ‘above us’; other prayer relates to God ‘around us’ or ‘within us’. These are three routes to the same transcendent being or God. The essential claim of the doctrine of the Trinity is that these three routes all lead to the same place, that the divine that we relate to above us, around us and within us is essentially the same divinity. The practical significance of this is that whichever route to the transcendent you most like to follow, it is not the whole story; there are two other equally good routes to lead to the same place. It is a mistake therefore to imagine that any one route is the only one, or even the best one. The idea of the Trinity encourages us to keep all three routes open. To this, Christians want to add one extra point, that the facet of God that is about active manifestation (the ‘Son’) can be seen in a special way in Jesus, and that there is an identity of nature and purpose between Jesus and the other facets of God. But that claim is logically detachable from the core idea of the ‘Trinity’ that there are three ways of relating to the one God.